Here was have a yard sale find. 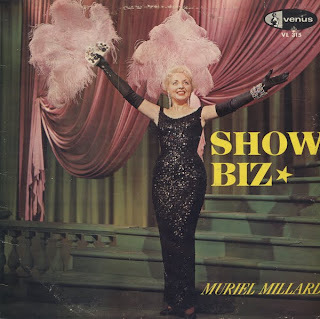 The album jacket cover is in English but the back cover and label are in French with the exception of the last track on the B side, Show Biz (which, oddly enough... is sung in French). Millard is a club, or cabaret performer. According to an online Canadian Encyclopedia, Millard wrote most of her songs after 1960. 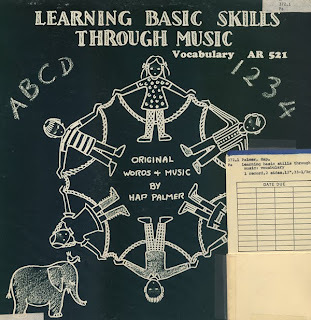 So, perhaps she wrote the songs on this LP. At first glance, I never suspected this album to be 1955 vintage. The quality of the cover design seems more early "60s" to me. 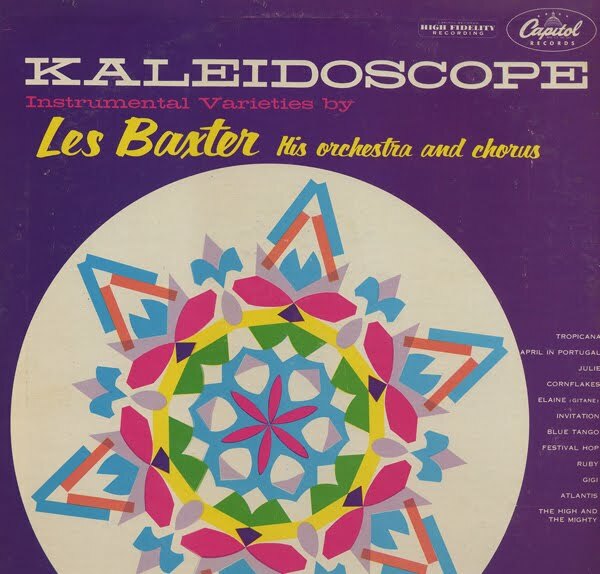 "Kaleidoscope, Instrumental Varieties" is a nice way to label an album that contains songs that are not "thematically" consistent. There are "easy listening" tracks mixed in with the more atmospheric "exotica" tracks. 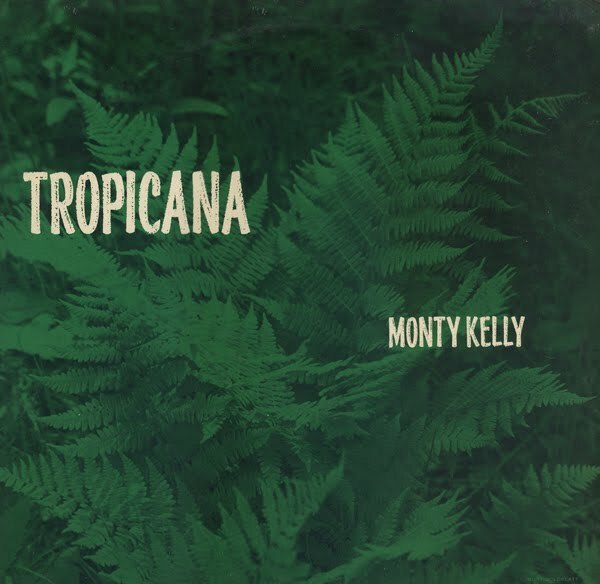 The album kicks off with a nice cover of Tropicana. The B side is more "mood" capped off by a fab tune titled Atlantis. This is an excellent album full of mood atmosphere that appeared in the June 6, 1964 Billboard Pop Spotlight Picks with the following blurb: Messrs, Ferrante & Teicher continue to make beautiful music even more beautiful with their dual pianos. Back by a large orchestra, big arrangements and an impressive list of songs, it all adds up to first-rate entertainment. 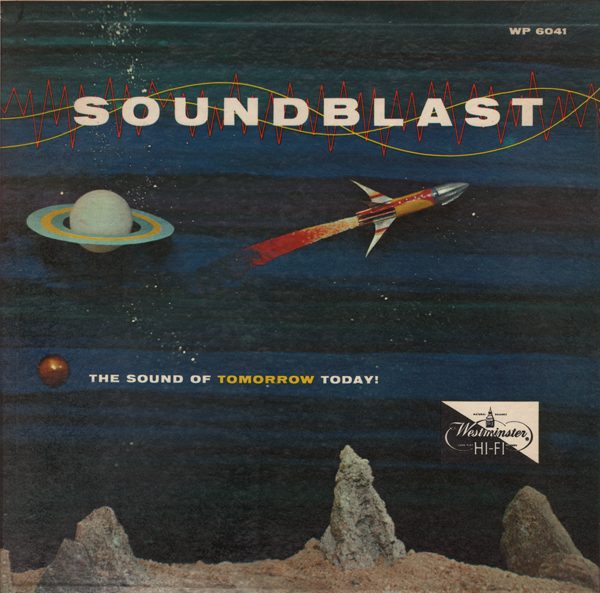 This is a re-release of Soundproof (1956). 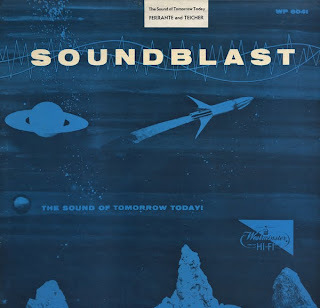 According to spaceagepop.com this is the mono release of the stereo re-release of Soundproof (same songs). I will assume the the stereo version of Soundproof features the same songs as the mono version of Soundproof. Confusing. Both LPs feature collectible jacket art. And this is an excellent LP that features experimental sound throughout. 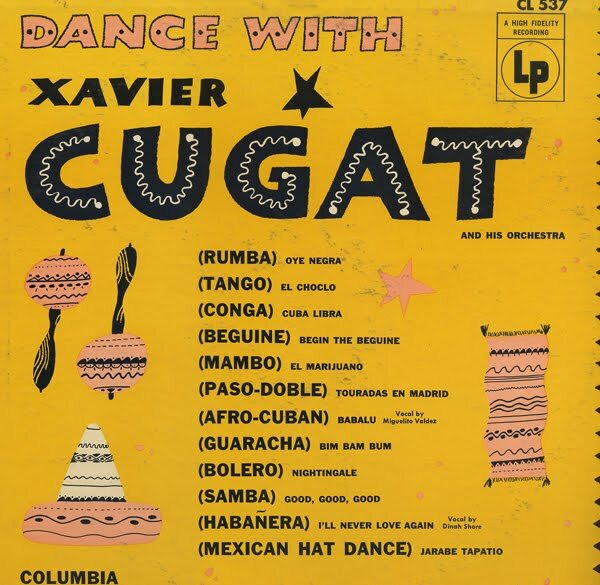 This is an excellent space age cover and album by Cugat. Of course, I have yet to run across a Cugat album that I don't like. He has a way of making most songs sound hip. There are great covers of Brazil and Tico-Tico on this album. 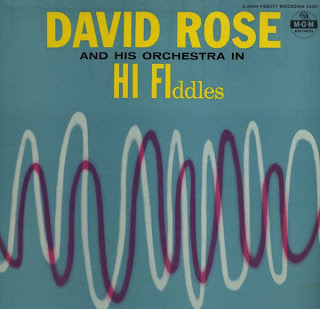 David Rose was married to Judy Garland for about four years (divorced in 1944). 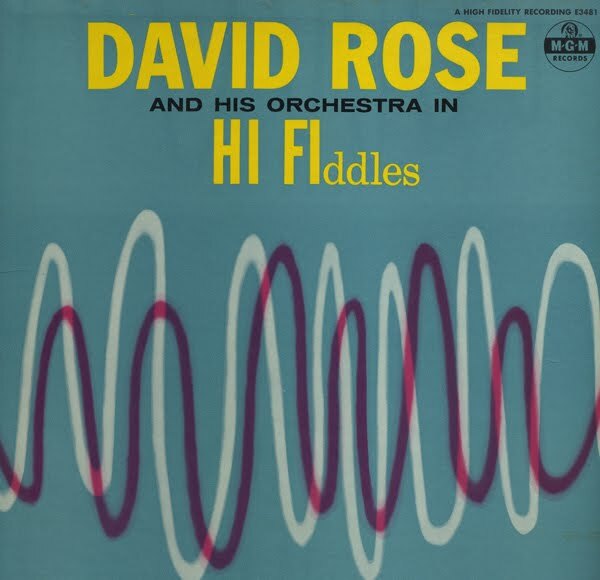 I don't see this album listed on the several online discographies of Rose's work. There are mentions of the LP here and there and you can find the album in a 1957 MGM Billboard display ad. This is a nice space age, bachelor pad set that features light, hip and fun music. There may be better songs on the record... but no better title can be had. Satan And The Polar Bear appears as track 3 on the B side! It's to bad for me that you can buy this song as a download on Amazon. I'd love to share it. From Billboard Magazine May 6, 1957: LeRoy Anderson tunes like Sleigh Ride, Syncopated Clock, etc. are well known enough but they are better suited to bigger and more colorful ork groups than that obtained by multi-track guitar disking. 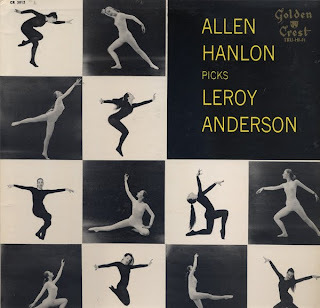 Hanlon's technique is tops but it doesn't add up to much of a commercial LP package. Cover seems to have little connection with the contents. I do love the cover, but there isn't much relation to content. And use of multi-track recording didn't help fatten up the sound. The audio on most tracks sounds thin and restrained. 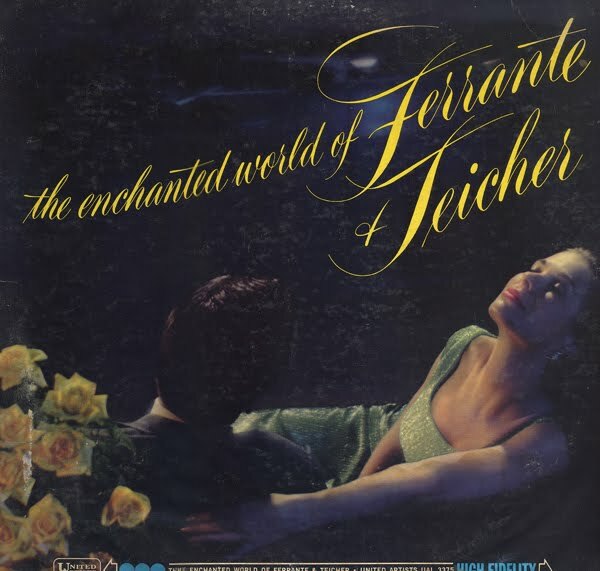 Serenata, track 3 on the B side, features a touch of personality. The Activity And Excitement Of An Actual Big Game Hunt! 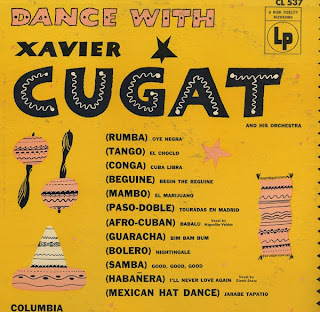 Lovely cover on this Cugat album. This set itself is a bit inconsistent. A few "space age" tracks feature bit of an "exotica" flavor (Nightingale) and a few tunes feature vocals. 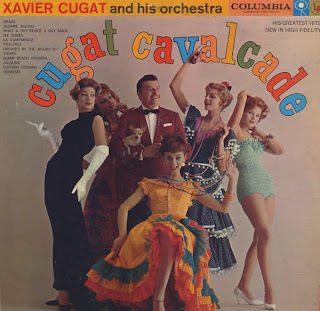 Fun stuff for the most part and, as usual for Cugat, more engaging than most other Latin artists working at the time. Here we have another great vintage cover. This is a two color print job, red and silver metallic ink (reflective ink) which is unusual. 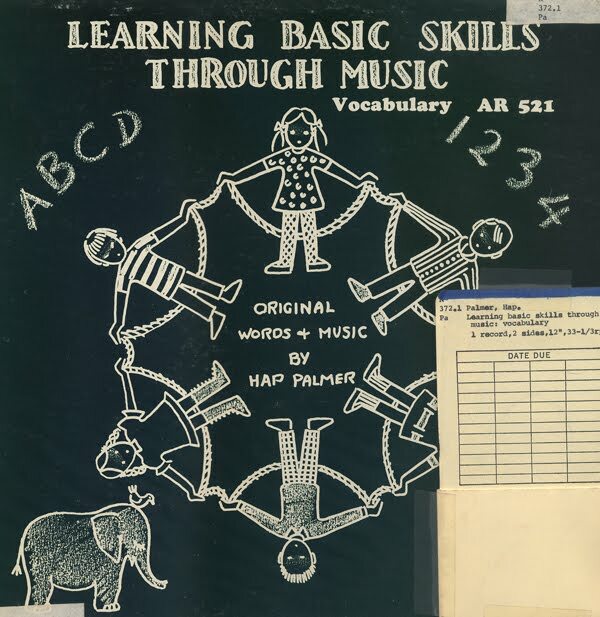 Allegro jackets on their 12 inch records were constructed differently then all other 12 inch jackets, slightly smaller and printed on heavier cardboard. Many sported engaging designs. This is an "Allegro" labeled jacket with a "Royale" labeled record inside. Royale's catalog consisted of re-releases of Allegro Records. 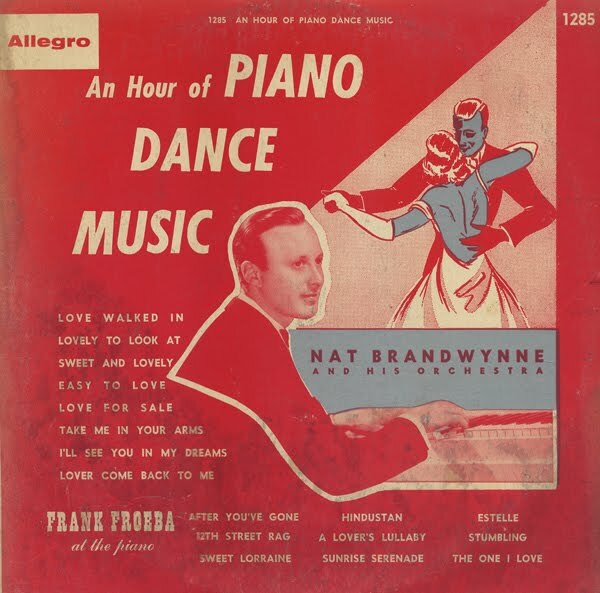 Froeba was a house pianist for Decca in the 1930s and 40s. The record starts off with some very standard 30s sounding band backed dance tunes but then and thankfully, transitions to some nice light jazz (not at all "dance" music) which Froeba is better known for. These inconsistencies are common on this label. They pressed what they could beg, barrow or steal. 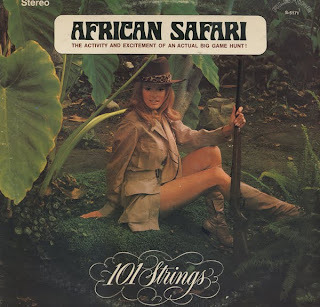 This is an excellent early exotica flavored LP. I also ran across this set sporting the same jacket design on a site featuring Essex label releases. The catalog number is ESLP-203. A 1955 release. A 1953 Billboard article explains that Kelly signed a two year non-exclusive contract with Essex to make 32 non-exclusive instrumental sides. The tune Tropicana, from this album, was done to full fill part of this contract. At some point Kelly went to work for Somerset as a staff arranger. He worked on 101 Strings albums composing at least 50 tunes according to a 1967 Billboard article (Monty Kelly And The Soul Series). The article goes on to point out that Kelly showed devotion to all types of music and was prolific. I don't see Kelly listed on spaceagepop.com. This surprises me after listening to this LP and reading the Billboard article. Kelly seems like a good fit. About half this album can be found on a CD collection (Bali Hai excluded) titled "The Golden Age Of Light Music: Great American Light Orchestras". This is a great album cover. Chippy is a two color (red & white) print on embossed die cut foil and then applied to the cover, like a sticker. I can find almost no mention of this album online. 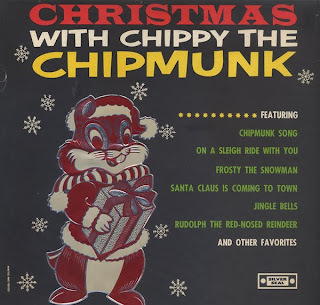 At first, I thought that this may be a rip off of the "real" Chipmunks. It is and maybe worse is than that the Chipmunk Song found on this record is an direct copy of the Ross Bagdasarian song released in 1958. I'm not a Chipmunk scholar... but I don't think the other tracks are direct copies. They seem to be far more budget basement chipmunks. Santa Claus Is Coming To Town is not a copy. 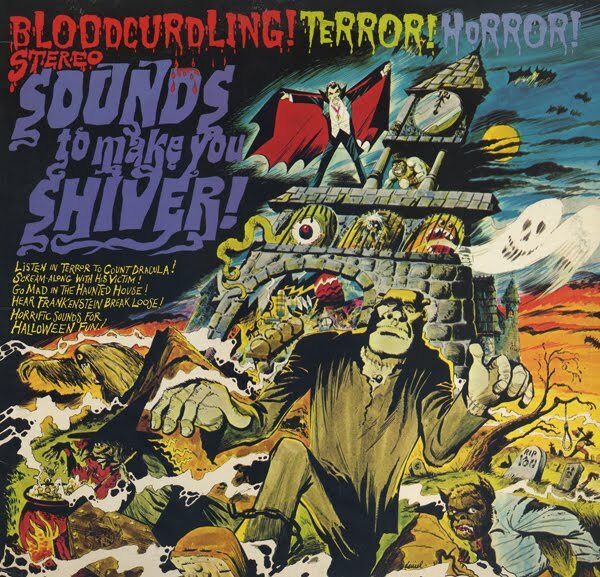 This album is a great collectable for the lurid and garish cover art. 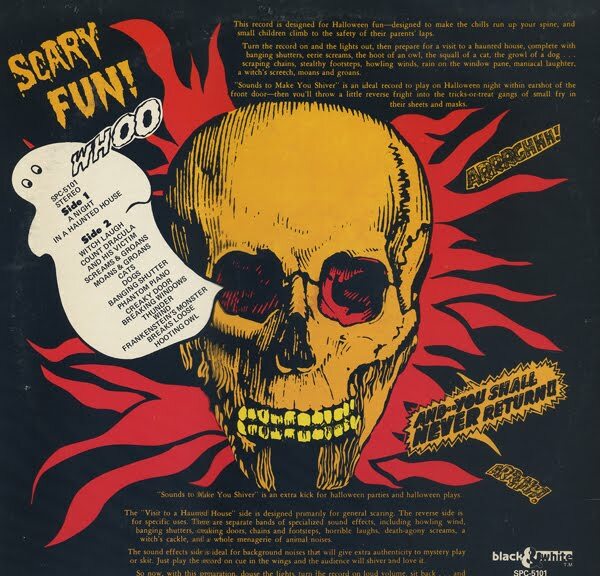 Side one, A Night In A Haunted House is one long wind storm with other FX thrown in. At one point there is even a little music which is nice. The recording drifts and the use of FX is sparse making this a good recording for use in other audio projects or for video presentations. 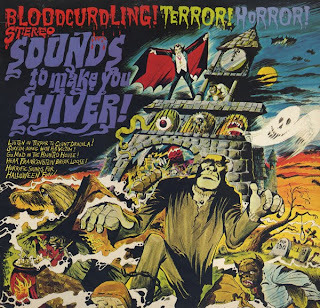 Side two has some nice creepy sound effects. Phantom Piano is very cool. 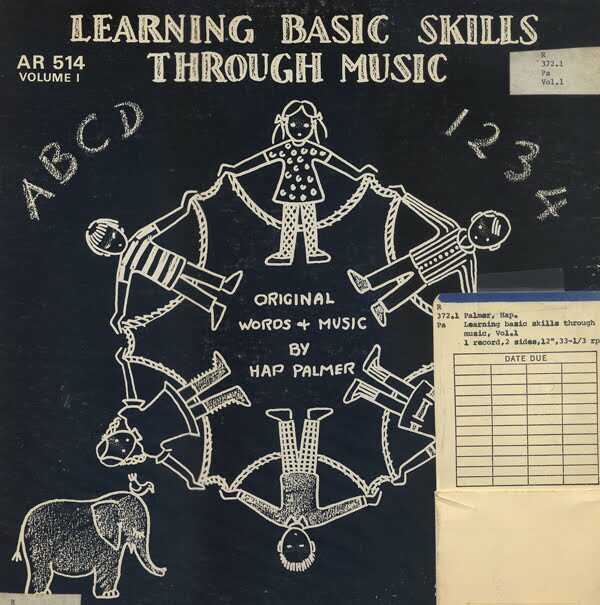 I think this is a re-release of a Pickwick album (same cover art, but no "Pickwick" logo). The album may also have been released on the SOMA label. I've seen the album on another blog sporting the same name but with a different and very fun cover imagine. Here is another incredible Peter Pan record. A while back I featured a Peter Pan "Disney" knock off record. On that record Peter Pan used illustrations on the jacket that looked like very much like Disney characters. I don't know how they got away with infringing on the Disney brand. Now I find this "Sesame Street" album. Interestingly enough, this album is labeled "Another Peter Pan Original" while at the bottom of the cover (out of the frame on my scan) there is a line of copy: Not affiliated with the T.V. program "Sesame Street". At the same time, the back cover is loaded with copy explaining the actual T.V. program mentioning Jim Henson and actual character names. 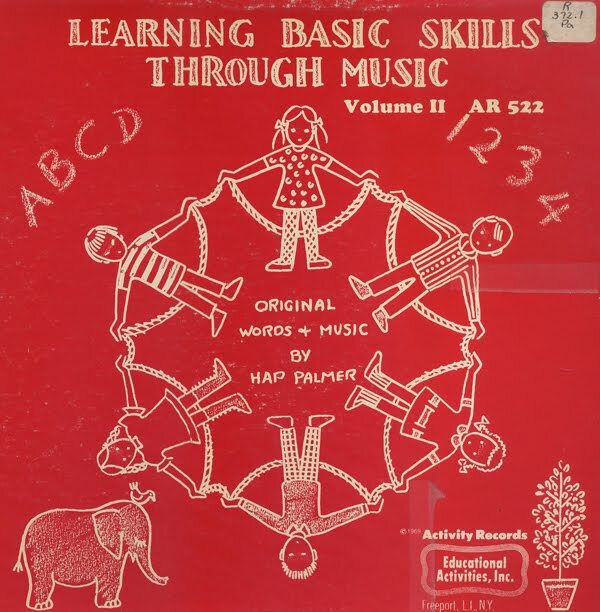 The songs are by the "Peter Pan Orchestra and Chorus". For the most part, the sound is total early and not so great 70s adult easy listening. Any kid who thought he was going to hear The Cookie Monster sing a song was in for a hugh disappointment. 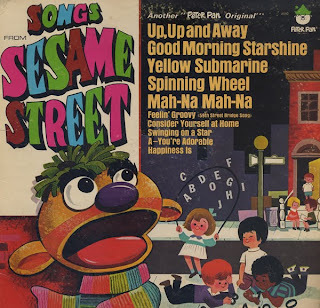 Apparently, according to the back jacket, the song "Yellow Submarine" (not this version, of course) was actually used on shows number 17, 62 and 102. 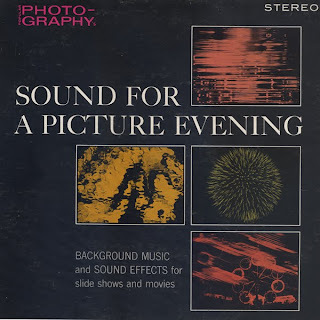 This an LP marketed by Popular Photography magazine. I'm assuming sales were largely made through advertising in found in the magazine. There is a Capitol Records logo on the record label. Apparently, the record was made to accompany home movies and slide shows. There are a variety of easy listening selections and some sound effects with suggestions as to what type of slide show the track would best work with. Gay Party, for instance, "fits just about any party". I can not find any information on who The Twisters were. Treasure Records, as far as I can tell from the back cover, was a budget label operating out of Mount Vernon, New York. 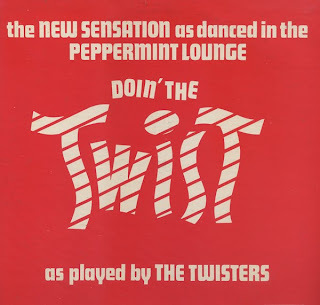 The "Peppermint Lounge" is mentioned, as an advertising gimmick on the front cover. 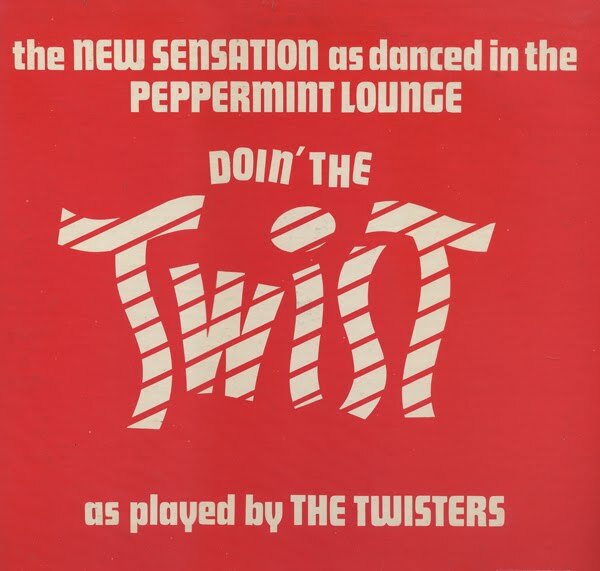 This dates the album to 1960 - 62 when the Twist fad was in full swing. 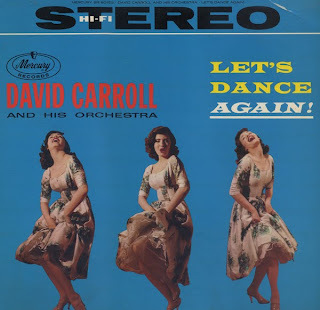 Many of Carroll's album covers are bold cheesecake fun. The music isn't great 60s cheese or good space age pop. Curiously, there is one track on this LP that gets the exotica/space age pop job done nicely. Swamp Fire, is very cool and sounds strangely out of place amongst the sugar coated white bread "dance" tunes. Wonderful space age pop album by brothers from The Tabajara tribe of Northern Brazil who created a night club act around Brazilian and Latin folk songs. Real information is lacking as RCA was careful to package the duo as they saw fit. As an exotic act. 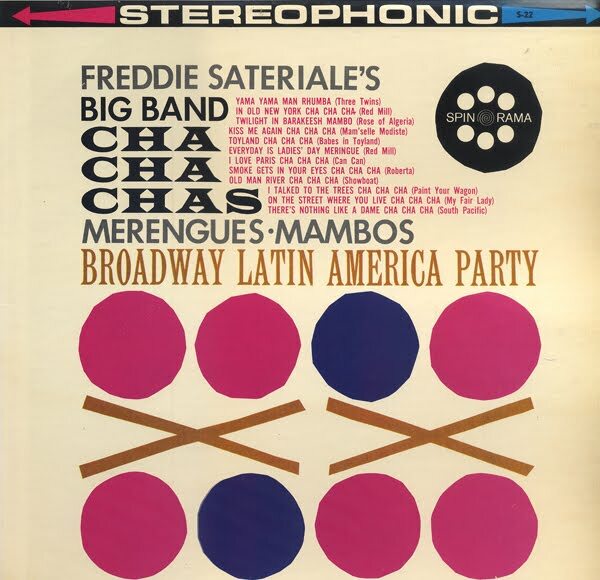 They charted a Top 10 album with their first RCA release, Maria Elena. The novelty worn off and their next release barely dented the Top 100. This album is their third RCA Victor effort. Apparently, however, their records sales were such that RCA would continue to produced as many as 18 more Indios LPs into the 1980s. Needless to say, St. Louis Blues is not a Latin folk song. I post the sample because it is a unique cover of that tune. 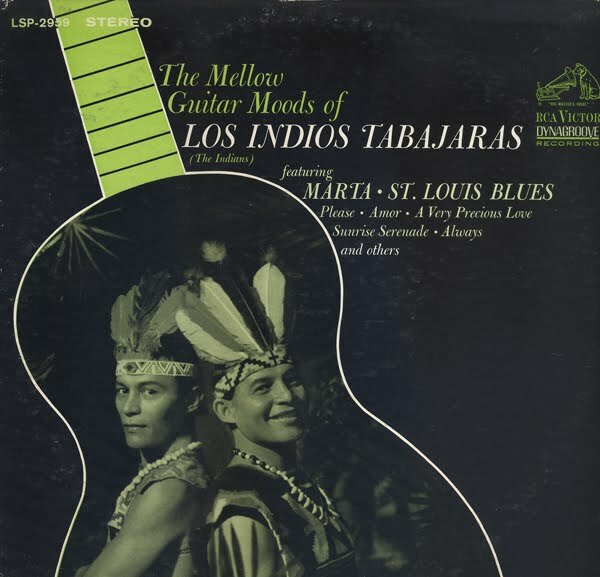 I found a Los Indios "best of" CD on Amazon (a pricey import) that includes two songs from this LP, Amor and Angelitos Negros. Much of their music, however, can only be found on vinyl. Very little information to be found on this album or artist. The jacket design looks to be early 60s (after Enoch Light's Command Label jacket designs). I think this LP may be the stereo release of an earlier Spinorama release, MK-3038. Nice clean basic space age big band Cha Cha. Sounds like Palmer mixed a a touch of The Beatles into Let's Dance. The lesson? 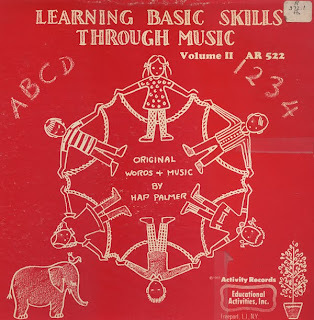 Learn the basic skill set necessary for getting down with your bad self of course! Creed Taylor's follow up to his great album titled SHOCK. From the back cover: One point first: if you think, upon first hearing it, that this album is simply a kind of Muzak for morticians, you may disqualify yourself right from the start. It's a free country. Side one on this LP seems to lack the atmosphere I was expecting. It seems a bit too "Spike Jones" for me. That is, with the exception the 5th track titled Out Of This World. 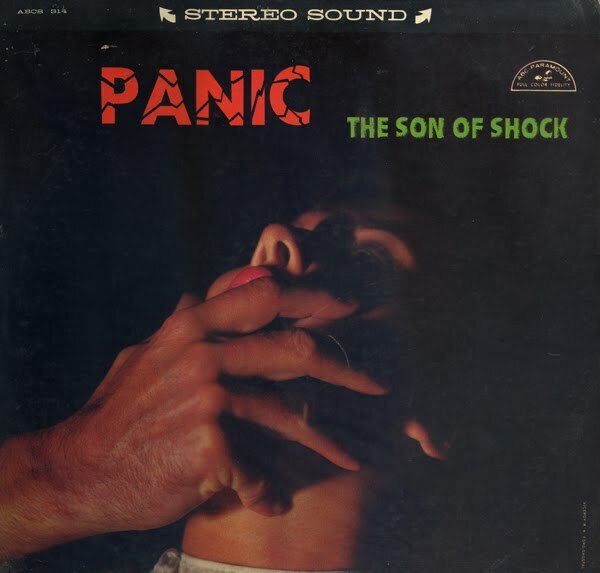 This song has a great 50s science fiction feel to it and end unexpectedly with dogs barking. Side two plays for me much better. The tracks are titled Heartaches, Rain Alpine Honeymoon, A Shot In The Dark, The Fastest Gun and No Smoking. They are moody, atmospheric and quirky.